This story starts how most of my stories seem to during this trip: it was a grey, wet morning, and I was climbing a really big hill. Except this time, this hill felt like a borderline mountain. 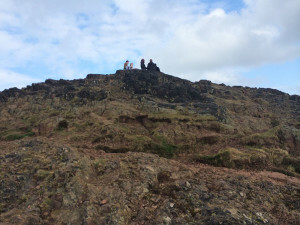 Standing at 250.5 meters—or roughly 822 feet high—getting to the submit of Arthur’s Seat means going though the grass and the rocks and the mud. 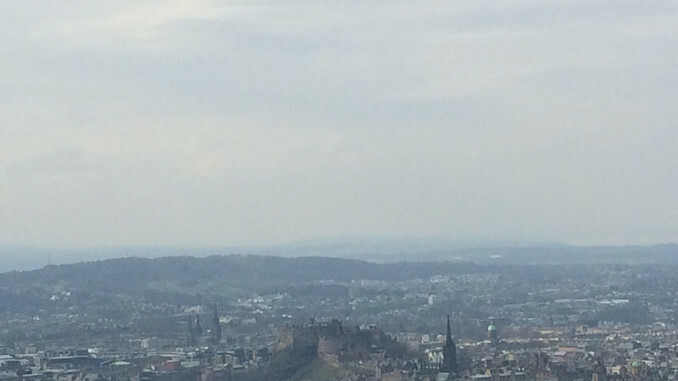 And, of course, I get half way up a much more climbable hill before I realizes the base of Arthur’s Seat is a 20 minute hike, that’s mostly uphill, from where I started what was supposed to be a well-planned adventure. But that hill was there, and I was determined to climb it. According to legend, at the submit of this dormant volcano was the location of Camelot, the home of the famous King Arthur, holder of Excalibur and his Knights of the Round Table. After climbing it, I find it either to be the best or stupidest place to put a castle. On one hand, you can see for miles from the peak, and there are quite a few flat areas at the top that one could build on. 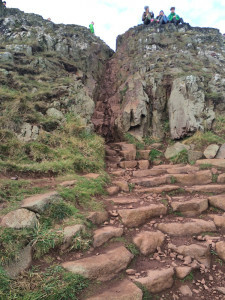 There’s even what appears to be a set of ruined stairs near the summit. And nothing but the large murders of crows can get the drop on you. So security isn’t a problem. On the other hand, nobody is going to visit your castle except the very determined, the very loyal, and the very stupid, who like me, will look at it from the ground and decide it’s not that bad of a climb. Then, about a third of the way in, decide that maybe this wasn’t the best idea ever, but you’ve come this far and you can’t turn back now. But despite the mud and the climb that you feel every step of for the next few days, it’s some of the prettiest views and most picturesque landscapes I’ve seen since I’ve been in Scotland. Especially since half way up, the weather decided to be uncharacteristically pleasant. The sun came out and the sky was blue. It turned into a 60-degree day on that oversized hill, which surprisingly only took an hour and a half to climb on the muddy foot trail. It was worth it to look down where I started and see little ants about to make the same climb I just finished, the view of the North Sea still looking gigantic while the once proud fortress of the castle looks like it’s only a model now. It’s a climb that I would make again if I had more time and energy. But I guess by now it’s clear that I’m a sucker for views.